It has been no secret that parts of Downtown Jacksonville have not been the hot spot to be seen or just hang out for an amazing dining experience, well that all changed in late 2017, when Cowford Chophouse finally opened its doors. Jacque Klempf, a co-founder and partner in Forking Amazing Restaurants decided that it was time to bring something fresh back to the downtown area and revive all the Riverfront area has to offer. He spent at least $6.4 million and maybe as much as 8 million increased since the initial permits he requested in 2016, One thing that is for sure he has brought the Bostwick building back to life in a full historic renovation that looks better than has it has in over 50 years. When you walk inside of the restaurant you will find it hard to find a dining area something so spacious and also a work of art anywhere in Jacksonville. It is something right out of New York or Las Vegas. It’s a very upbeat vibe where everyone in the restaurant feels a part of what is going on around them. The restaurant has received recognition from the Florida Redevelopment Association and the Urban Land Institute, that the property will be LEED certified. This is huge in a market where not many restaurants exist with that certification. 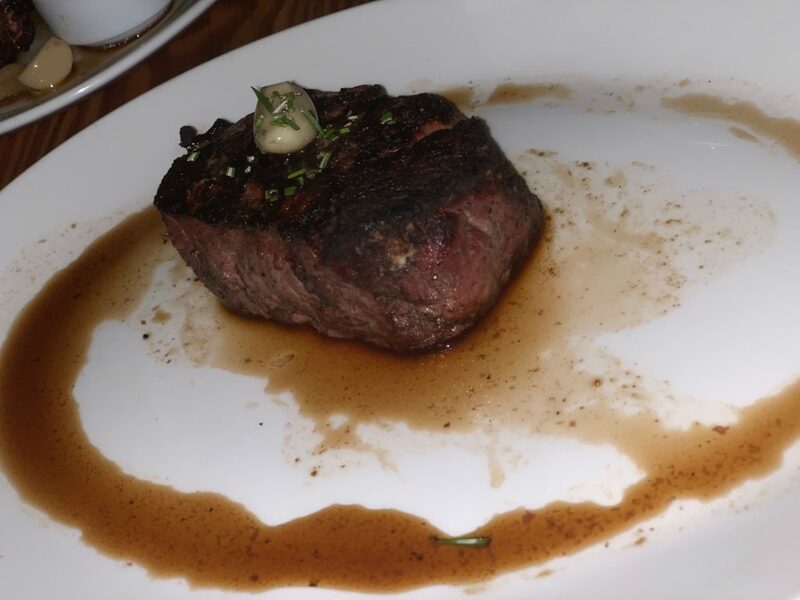 Okay, so lets forget about all of the design talk, there is plenty enough for an entire review on design… so lets focus on what people really come here for, their Prime Aged Steaks and amazing seafood selections. We found their sides to be extremely filling as well. There are plenty of great options to get you started, two that are highly recommended are the She Crab soup and the Woodfired French Onion soup. The amount of crab and topped with Caviar in the She Crab soup make it our favorite and will have you craving for another bowl. For those steak lovers, this place beats anything in Northern Florida hands down for quality of the finished product. Their wood smoke flavor that comes from their distinct European ovens makes all of the difference in how the steak tastes and it is prepared. All of the steaks have the choice of some unique sauces for $4.00 each and a must try sauce is their bacon bourbon jam. Keeping the smoke flavor alive that’s for sure. Colorado Double Cut Chops For those Looking for a Non Steak Options. 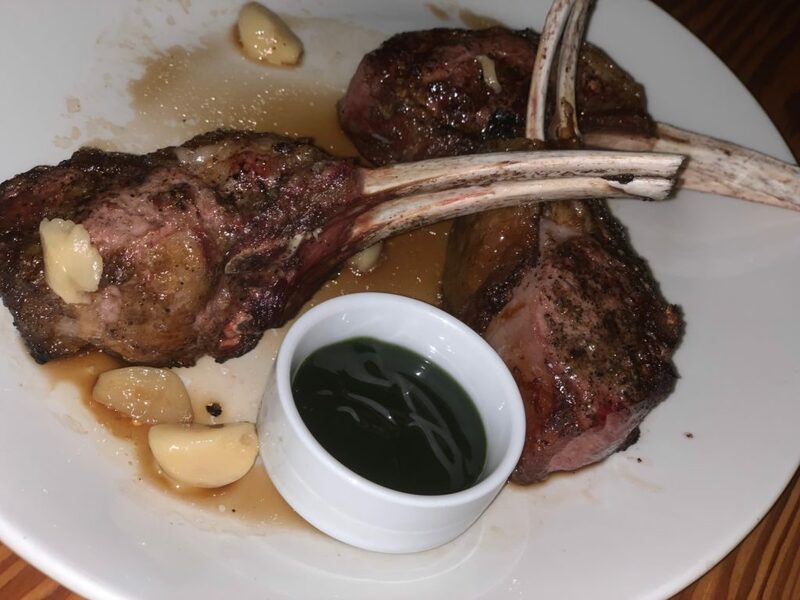 Another item that is not to be missed are their Colorado Double Cut lamb chops. These are huge and a great option for those who may not want a huge cut of prime beef. Grouper with toasted farro, swiss chard, roasted gold and red beets, garlic cream is another not to miss item on the menu. No meal is complete at Cowford without their dessert selections. We found their Cinnamon Roll Brûlée made with a house-made cinnamon roll, vanilla bean crème brûlée, powdered sugar icing to be the most unique we have seen in a long time at any place that offers steak. While their other options are just amazing, this one is just a lasting memory that will leave you wanting to recreate this at home. Once you are done with your amazing meal, take a quick stroll and enjoy one of their amazing cocktails on the rooftop. The views of downtown are amazing and a welcome addition to a once very dated area of Jacksonville. If you are planning a trip to Northern Florida or just passing through on I95, this is a place worth a few hours of your time, or the entire evening you want to hang out on their rooftop.